Perhaps you are a person who is interested in domestic energy consumption. It's not a subject area that absolutely enthrals me, I will admit, but it does interest Mike and he has kept a record of our monthly energy consumption from our electricity meter since we moved in. I did think it was worth sharing the graph he showed me today and making a few observations on it. Electricity is our only externally-supplied fuel: we don't use natural gas or heating oil, so this graph represents our entire energy usage except for the wood we harvest from our land (which so far has been mainly from fallen or dead trees). A cord of wood generates heat at approximately the equivalent of 6,000 kilowatt hours of electricity. We probably burn about five cords over the course of an average winter. During February 2008 we ran out of wood to heat the house and our electricity consumption rose, peaking in March at 3,500 kilowatt hours as we had to use the electric baseboard heaters instead. In that month, the average temperature was -2.3°C/28°F and there were 29 days where the temperature dipped below the freezing point. The dip in consumption in the January of 2008 was a result of us starting to use the big woodstove in the kitchen in that month (which we had been warned not to, as it didn't meet current safety codes - but there comes a point where all risks are outweighed by benefits and we reached it!). In the summer of 2008, the geothermal system went in. In the last two winters we've had plenty of wood to burn, which has been our main source of heat, with the geothermal kicking in when it is really cold overnight and in the early mornings. With the exception of August 2009, our electricity use has actually been lower in 2009/2010 than it was in the first year of having the geothermal system. A lot of this can be attributed to the improved layer of insulation in the attic (installed January 2009) and to the windows and doors we've gradually been replacing. It hasn't been as cold this winter, either: over the November to February months, the average temperature has been nearly four degrees Celsius (seven degrees Fahrenheit) warmer than it was in the 2008/2009 winter. We've reached the point now where our solar panels are generating the same amount of electricity that we are using - so our domestic consumption is getting close to being self-sufficient (although we are still using fossil fuels in our car and in the tractor). To put all of this into context, it might be helpful to compare our energy use here to that of our old house in Manchester. There, we were using natural gas for heating and stove-top cooking. In the course of a year we would use the equivalent of 15,000 kilowatt hours of gas and 5,500 kilowatt hours of electricity (so 20,500 in all). Our total electricity use in a year here is 12,000 kilowatt hours, or about two-thirds of our previous usage. Which is quite a big difference, when you consider that the Manchester house was about half the size of this one, and the climate was considerably more temperate! And if you're wondering, no, we didn't sit in the dark with candles for Earth Hour on March the 27th and I doubt we'll be doing anything for Earth Day (or Week, or Month, or whatever's next). Just get on and do something that has an impact all year round, I say. Envious of your solar panels. This is in our planning - after the backlog such as new floor in kitchen. Perhaps it should come first. 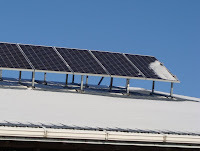 I would love a couple of solar panels on the roof of my scottish home just for heating water - up in Inverness some of the new houses have those and they are so efficient. I'm totally impressed. It must feel fantastic to be self-sustaining. Was the geothermal thing very very expensive? Amen, Earth Day shouldn't just be a single day to pay attention to the environment. Every day should be Earth Day, which is celebrated on April 22.